Residential exterior maintenance is a vital component in creating a comfortable, safe and relaxing environment for building tenants. Buildings should be in excellent condition, free from peeling paint, cracked windows and structurally sound. At SMS Assist, we help residential property managers standardize their approach to exterior maintenance by providing a simple, turnkey process to handle work orders while simultaneously lowering total operating costs. Exterior residential maintenance services should be handled by reliable, knowledgeable professionals with the tools and capabilities to take on any exterior maintenance task. That’s where SMS Assist comes in. Strategic residential exterior maintenance puts the processes in place to respond to proactive, reactive and emergency maintenance needs. Property managers need a solution that eliminates complexity, lengthy work order cycles and high operating costs. Designed to streamline residential maintenance strategies, One by SMS Assist is our proprietary platform that gives residential property managers access to professional contractors (Affiliates) that take on maintenance requests. Moving beyond traditional, static residential property management, One by SMS Assist facilitates exterior maintenance strategies from start to finish. Tailored to individual maintenance requirements. Through a unique business model that eliminates unnecessary costs and back-office processes. 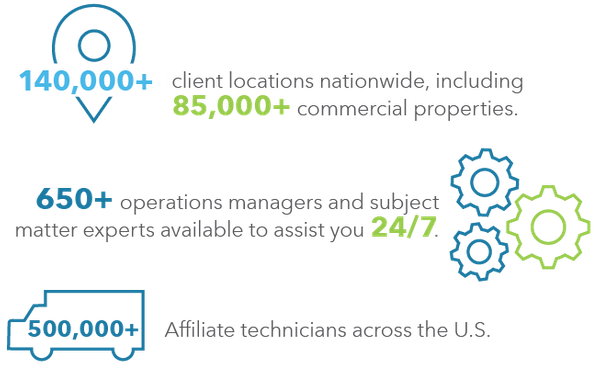 Ensured by in-house operations specialists who dispatch Affiliates to your location. Delivered through granular data and reports from our technology. Upgrade your residential exterior maintenance strategies today.